Ms. Motyka gives Gabby Mercier a hug. A standing, whooping, stomping ovation, and even some tears, greeted the dedication of the 2017 Williston Northampton School yearbook, The Log. 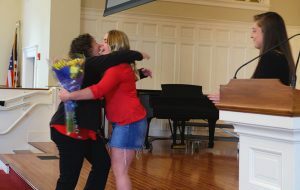 Its three editors—seniors Emma Reynolds, Gabby Mercier, and Saul Blain—announced at a recent assembly that this year’s edition is dedicated to Jenna Motyka, coordinator of student services. Mr. Seamon captured video of the moment. The following is the transcript of the dedication, which was read by Emma Reynolds. “Whether you are a student, faculty member, or campus visitor, the first person you see when entering our Schoolhouse is often Ms. Jenna Motyka. No matter how her morning has been, what she is working on, or what day it is, you can expect a cheerful, “Good morning!” which is likely followed by your name (She knows everyone!). Ms. Motyka is, without question, exactly the friendly and helpful person that we all need to see first thing in the morning, though many of us take her for granted. It is not her job to simply greet everyone who walks by, though that could easily fill a day. Ms. Motyka works tirelessly to support the Deans Office, monitor student attendance, field parent phone calls, manage travel arrangements, keep track of community life budgets and much, much more. “’Jenna Motyka is like my right hand!’ exclaimed Anne O’Connor, Head of Security, when asked about how Ms. Motyka supports her department. Most students don’t think of her as a part of the security office, but Ms. Motyka is looking out for students’ safety and their whereabouts all day, every day. We may not like being marked absent or late, but she is genuinely concerned for our safety and wants to make sure we get to where we should be each day. As a parent Jenna makes you feel that she personally has an eye on your kid AND is their biggest fan!! I think it is a wonderfully well deserved honor.